Wow. 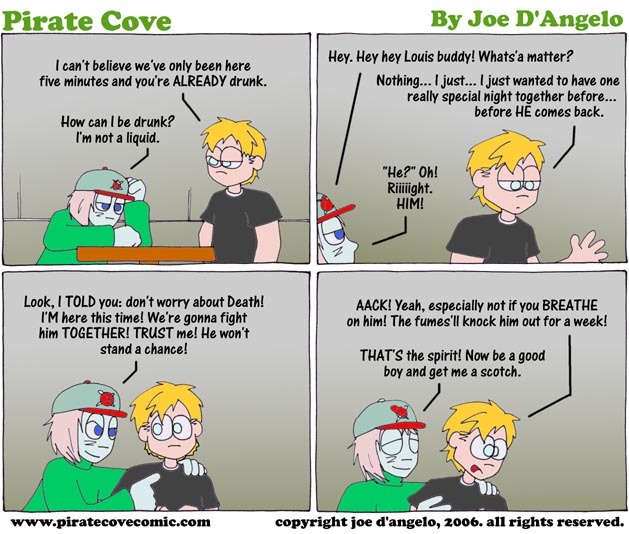 Almost five years into PIRATE COVE and we have a first, ladies & gentlemen! Monday afternoon found me not at a barbecue or relaxing by the beach... no, it found me meandering back to the office to pull Tuesday's strip off the server. Then, with pencil in hand, I proceeded to totally re-do the comic. See, I knew where I wanted the story to go... I just didn't set it up properly. And it was bothering me all freakin' weekend. But in case you were wondering what today's comic strip ORIGINALLY looked like, here ya go! OK, now I gotta go in and make some changes to Wednesday, Thursday, & Friday's comics so this all makes sense. Back in a few!